Did you know that EPCOT stands for Experimental Prototype Community Of Tomorrow? You can see Walt’s original idea for Epcot in the People Mover ride at Magic Kingdom. The focus of this park is all about life, invention, creativity, and culture. Being the second largest park at Disney World, Animal Kingdom being the first, Epcot has so much to offer. With a park that size, you’ll want to do your research, especially if this is your first visit. 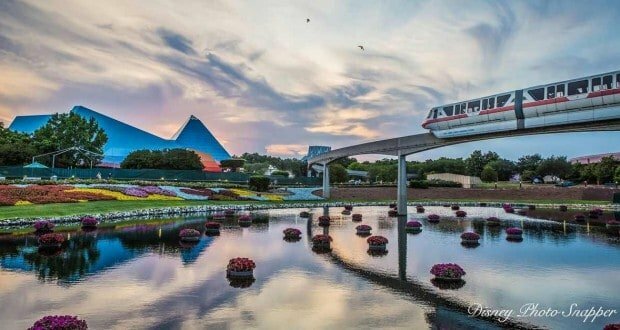 To get you started, here are 8 things you should know before heading to Epcot. Much like Magic Kingdom, it is nearly impossible to get everything done at Epcot in one day. Therefore, I recommend taking two days to explore the entire park. This way you don’t have to rush and can take time to admire even the small things. The park is split into two sections, Future World and World Showcase. Future World is where you will find the majority of the rides and attractions. In World Showcase you will find the countries. There are tons of great restaurants and snack stations to try. Remember to take time to appreciate the architecture and details of each country. You may even learn something new. Epcot has a tiered Fastpass+ system. Which means you cannot just choose any three Fastpasses you please, you have to choose from a list. The first tier will consist of the “big” rides, or the most popular rides. This includes both Soarin’ and Test Track, as well as viewing spots for Illuminations. The lines for both rides are usually very long, even if it’s value season. You can only chose one attraction from this list. This won’t be a problem if you follow the previous tip and choose to visit the park twice. The second tier consists of rides that don’t usually have extremely long lines. These can sometimes seem like a waste of a Fastpass, but you have to choose two regardless. You can always change your Fastpass selections once you are in the park, but sometimes there aren’t many options available. So it’s always more beneficial to select them before you go. Epcot has some really fantastic dining options in both Future World and World Showcase; so make it a goal to try at least one. If you’re feeling adventurous, try one of the restaurants in World Showcase; each country has at least one restaurant. Some have characters, some don’t. You just have to do your research! I hear Germany and Norway have some of the best restaurants. Epcot is full of detail, especially in the World Showcase, which makes for beautiful photos. Future World also has some fun things to snap a picture of, like Spaceship Earth! If you decide to eat at one of the table service restaurants, you’ll see that they are beautiful inside as well. So feel free to walk around and get some great shots. The cast members are always more than happy to take photos of you and your family with your camera or phone. Remember, you can always delete pictures, but you never know when you’ll be back to take ones you missed! Each country in World Showcase has some unique snacks that you won’t be able to find anywhere else in Disney World, like gelato in Italy or school bread in Norway. This is a great way to try new things without having to buy a full meal. Epcot also offers a nice selection of adult beverages throughout each country, so drinking around the world works too! Margaritas in Mexico, German beer in Germany, and the Grey Goose Lemonade Slush in France, what more could you need? Epcot is home to both Food and Wine Festival and Flower and Garden Festival. Food and Wine Festival takes place mid September through November and gives you a chance to taste different food and drinks from around the world. Flower and Garden Festival takes place from March until May and offers beautiful flower displays as well as presentations and demonstrations. Neither of these wonderful events requires an additional fee; they are included in your park admission! Sometimes, especially with young children, it is easier to leave during or before the fireworks to avoid the crowds. But the Illuminations fireworks display is really not to be missed. It is arguably one of the best firework shows in all of Disney World, in my opinion. There’s nothing quite like it. So for at least one of your visits to Epcot, make sure you stay and watch all of Illuminations. I promise you won’t regret it! Epcot is big, that’s an understatement. It may seem a little overwhelming at first, but really spend some time wondering through each country. Don’t just walk through it, walk inside. Take some time to explore the gift shops as well. You may find something truly unique. Besides actually visiting the country, Epcot is the next best thing! After reading these tips, hopefully you can better prepare yourself for a fun filled day at the park. But most of all, just remember to have fun. Walt’s true vision was for families to be able to enjoy a theme park together. So don’t rush through it, just enjoy your time. Whether you have one or two days to enjoy Epcot, make the most of them and the time you have with your loved ones. Writing has always been my passion. I have had an interest in writing ever since I was young. Similarly, I have always loved Disney. There is not a day that goes by that I'm not reading or watching something about Disney. I am currently finishing up my bachelor’s degree and working as well. I live right outside of Chicago, but visit Walt Disney World Resort several times a year.